Freelance journalist Lauren Southern, formerly of Canadian media organization The Rebel, has made a reputation for herself online and offline by openly expressing politically incorrect views on social media, as well as in her reporting. This week, the crowdfunding site Patreon banned Southern’s account over claims her work would get people killed. Southern is no stranger to controversy, and has been physically attacked in public for making statements like “there are only two genders” and stalked during her coverage of the G20 2017 riots in Hamburg. Since departing The Rebel in March 2017, the right-wing journalist took to Patreon to crowdfund her work, which has revolved around the rise of anarchist movements in North America and the refugee crisis in Europe. In the middle of all this, she lost one of her primary avenues for continuing her work. “Patreon just deleted my account,” Southern announced on Twitter Thursday. The Daily Caller reached out to Southern to discover why the platform terminated her source of income. “They claimed I’m raising money that will get people killed,” says Southern, who showed TheDC the email Patreon sent her. She added that the company is refusing to even consider an appeal. 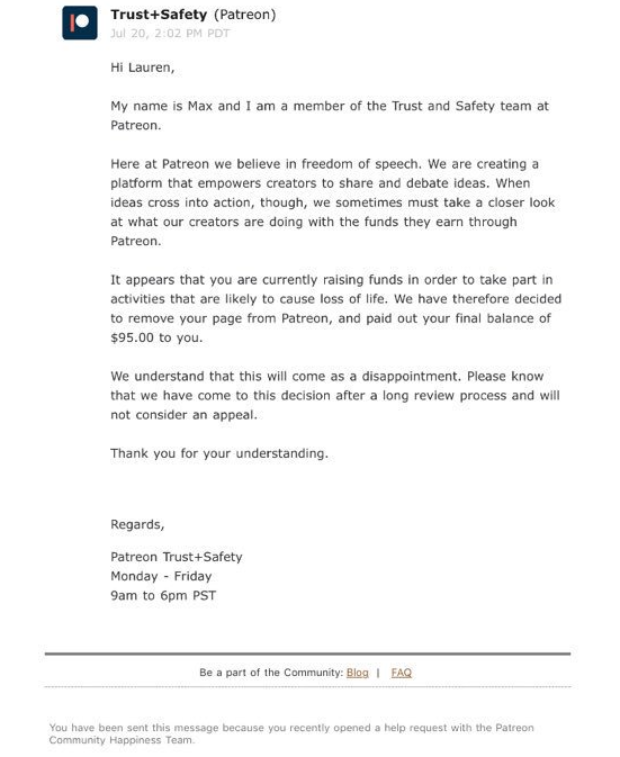 Southern rejects Patreon’s reasoning, and explained that her work on the Defend Europe ship is unrelated to any of her earnings from the site. The ship was chartered by anti-immigration activists to aid the Libyan coast guard in pushing back refugee boats to its shores, where they set off to Europe and sometimes capsize along the way. “If the review process was so long and so thorough I’m wondering how they missed the small fact that 1. I am not partaking in the mission and had stated that on both my Patreon and YouTube. 2. Not a single dime I made from Patreon or any other platform was going towards the Defend Europe mission and 3. there is absolutely no intent to put lives at risk on this mission even if I were fundraising or taking part in it,” says Southern. Senior members of Hope Not Hate, one of the organizations involved in facilitating the influx of refugees into Europe, openly bragged about causing Lauren Southern’s Patreon suspension. Posting on Twitter, Hope Not Hate founder Nick Lowles and senior researcher Joe Mulhall stated that the organization lobbied the platform to ban her account. Ian Miles Cheong is a journalist and outspoken media critic. You can reach him through social media at @stillgray on Twitter.